If you recently got braces in St. Louis and have found that you’ve developed halitosis, or bad breath, there’s a good chance that it’s being caused by bacteria remaining in your mouth. Your braces provide bacteria with many more crevices to hide in, making it extremely important to increase your focus on oral hygiene. Here are four tips from St. Louis, Missouri, orthodontist, Dr. Borello for better breath when you have braces. 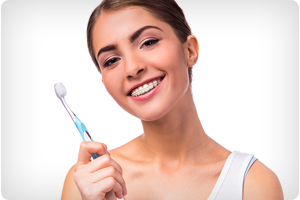 Oral hygiene is extremely important, especially when you have braces. If you have bad breath even though you’re brushing twice a day, it may be time to increase the number of times you brush and floss to 3-5 times a day. If you’re at work or school in the St. Louis area, bring a toothbrush, toothpaste, and some dental floss with you so that you can keep your mouth feeling clean throughout your day. This should minimize bad breath. The American Dental Association recommends that you replace your toothbrush once every three or four months. However, if you find that you feel sick, don’t have fresh breath, or the bristles on your toothbrush are frayed, you may want to replace your toothbrush more often. Thousands of germs hide out on your toothbrush, and when you have braces, it’s important to keep those germs under control. One excellent way to get rid of more bacteria than with brushing alone is to use mouthwash. Not only does mouthwash get into the spaces between your teeth (especially after flossing), it also kills germs and bacteria that still remain in your mouth. If you have a sensitive mouth and find that mouthwash burns too much, look for a rinse that specifically states that it doesn’t burn on the label. If you want to go a more natural route, you can also add several drops of tea tree oil and peppermint oil to water in a clean mason jar, along with a little baking soda. This solution tastes strange, but it doesn’t burn at all and tea tree oil is anti-bacterial, so it will help disinfect your mouth and kill bacteria. These devices are available at many different price points and from many different brands. Water picks are designed to clean not only the teeth but the miniscule spaces between your teeth and gums, even your braces where bacteria are hardest to reach. When you start using a water pick, you may find that your gums bleed at first, just like they might when you first begin flossing regularly. This inflammation of the gums will decrease as you use your water pick daily, helping to keep your teeth healthy and white as well as eliminating bad breath germs. Be sure to discuss any questions or concerns you have about flossing with your orthodontist in St. Louis. When you are ready to explore and learn about the braces and orthodontic treatment options that are best for you, call 636.625.4224 or click here to schedule your Borello Smile Assessment at our orthodontics office in St. Louis, Missouri. Call our St. Louis, MO orthodontics office at 636.625.4224 today!